Iraq's new Oil Minister Thamir Ghadhban has reportedly said that all coalition advisers will leave Iraqi ministries after the 30 June handover. Quoted by the UK's Financial Times, he said that the ministry would reassert full control over the country's lucrative oil industry. However, the new UN resolution on Iraq limits the freedom of action of the interim government about to take power. Mr Ghadhban also played down attacks by militants on oil infrastructure. "When sovereignty is regained it means that there will be no more US advisers, not only in the ministry of oil, but in every ministry in Iraq," he was quoted as saying in Thursday's edition of the FT. He accepted that, under the UN Security Council resolution adopted this week, the interim government could only make policies valid until it is replaced after elections in seven months. The minister also acknowledged that oil revenues would still be monitored by the World Bank and IMF through the International Advisory and Monitoring Board (IAMB) but said the new government would "be fully in charge of utilising the funds". The BBC's David Bamford notes that the IAMB was established to ensure financial transparency in Iraq, a key requirement for the global financial institutions. It remains unclear to what extent the World Bank and others might use this monitoring role to influence Iraq's spending decisions, our correspondent says. In his interview for the FT, Ghadhban said he wanted to "go back to the old healthy management of the 1970s when the Iraqi National Oil Company [Inoc] used to be financed from its own production, and the remainder of the oil revenues went to the government". Asked about privatisation, the minister, a veteran of the Iraqi oil ministry of 30 years' standing, said he had to "take some time" to decide. Mr Ghadban added that while attacks on pipelines had affected production, the country was still on course to bring in about $16bn in oil revenues this year alone. 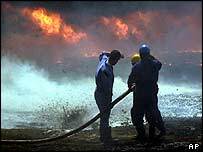 According to Iraqi prime minister Iyad Allawi, pipeline sabotage has cost the country more than $200m in lost revenues over the past seven months. 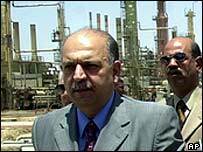 Speaking to reporters in Baghdad on Thursday, Mr Allawi blamed foreign militants for the attacks. "More than $200 million (£109m) has been stolen out of the pockets of a sovereign Iraqi government through the loss of oil revenues resulting from attacks to pipelines," he said. "These saboteurs are not freedom fighters, they are terrorists and foreign fighters, opposed to our very survival as a free state." Iraqi oil production in May stood at 2.1 million barrels a day, according to the International Energy Agency. With international prices remaining near $40 a barrel, the $200m in lost revenue accounts for no more than about three days' worth of national oil revenue. Who is winning the contracts?